Before Innform, the team spent the best part of the last decade building eLearning tools for hospitality companies. You can read about some of those tools here. We’ve seen it all! We met and spoke to hundreds of managers and employees, we designed and built several platforms for many brands awith different requirements: big teams, small teams, distributed staff, centralised staff, multiple language support, offline mode, slow internet connections, certification, normal quizzes, timed quizzes, fast companies, traditional companies, hotels, airlines, cafes, bars… even cruise companies. This experience and the diversity of our clients gave us some valuable insight. Rule number 1: Learning is about clear, concise and meaningful communication – and it turns out language holds they key to all three. The hospitality workforce is highly international, with people hailing from all corners of the planet. No matter how great the user experience or how engaging your courses are, the content must be written in their language. So we made this a rule: The interface (both the admin control panels and the learner’s apps) must be available in multiple languages and the content should be easily translatable. 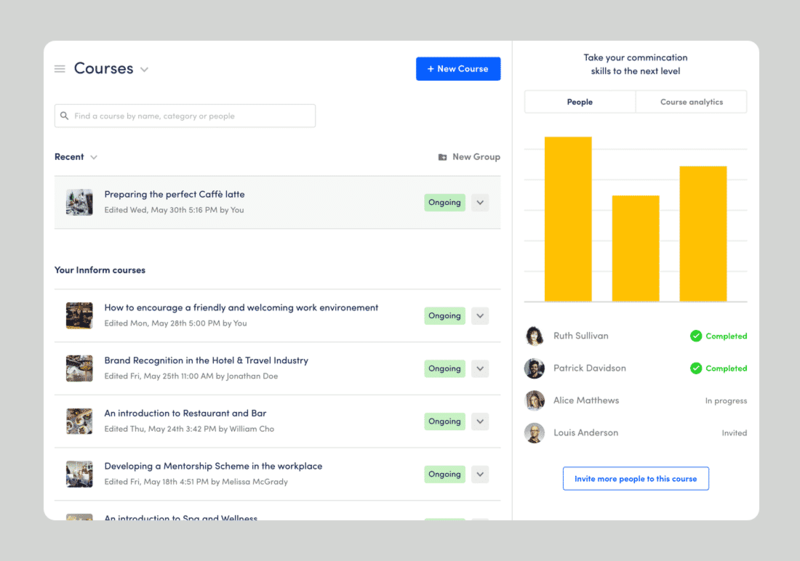 LMSs (Learning Management Systems) often impact the entire organisation, and are therefore something that managers consider very carefully – engaging your employees is a challenge, convincing trainers to create the content is another. But what we found, is that the major pain-point is a technological one. When a large company-wide system rolls out, the workforce must be notified, inducted and provided with a new account – this means new access credentials. This part of the process poses two key challenges: IT overheads and employee adoption. We solved both problems by leveraging the organisations’ existing platforms. Many companies run something like Microsoft’s Yammer which is basically a corporate Facebook. Employees will already have a Yammer account, therefore by authenticating new users through Yammer saves companies a lot of time and money. It acts as a direct bridge to the new platform which users find infinitely easier when accessing and engaging with the content. 3. Micro-learning is a thing, and it works! Once the tool is implemented, the first thing managers should do is set up an optimisation strategy. Content and the tool it self can be evolved over time to make it work better for that particular company’s learning culture and learner behaviour. What we often find, is that while courses should be informative, they must also be concise. We began breaking down courses into ‘lessons’ and made them available to the learners on a schedule (ex: posting a short lesson once per week). This presented learners with a sense of novelty, and made the platform more active, with fresh content coming in regularly. It also allows learners to go through the material at their own pace, it introduces a sense of calmness and control. We realised that brief lessons shared over time were having big impacts on internal adoption of the learning platform. If you ask any organisation about eLearning tools, this topic will surely come up: Video courses are expensive, but employees need them because everything is consumed in Video these days, right? Well, that’s partially correct. Yes, video is a great way to train staff members around almost any skill – but it doesn’t have to be expensive. Some of the most successful learning programmes we’ve seen were made of low fidelity video done by the company’s trainers or managers themselves – just like people make vlogs on youtube, trainers started to record their courses using cheap HD cameras and upload them straight to the platform without any special editing. The results were astonishing: learners were much more interested in seeing their own manager, someone they already know and have rapport with, training them around hospitality and their company than a stranger. Even if it was delivered by professionals, with perfect lighting and editing. There is something very effective about a personal approach to training, especially when it comes at the fraction of the price for hospitality businesses! Since the dawn of eLearning-time, the primary challenge was content creation – consistent, engaging and translated content. We tried a few solutions: episodic learning paths, micro learning, blended learning and so on. But the fact of the matter is, someone has to create the material and assign it to the right learners. 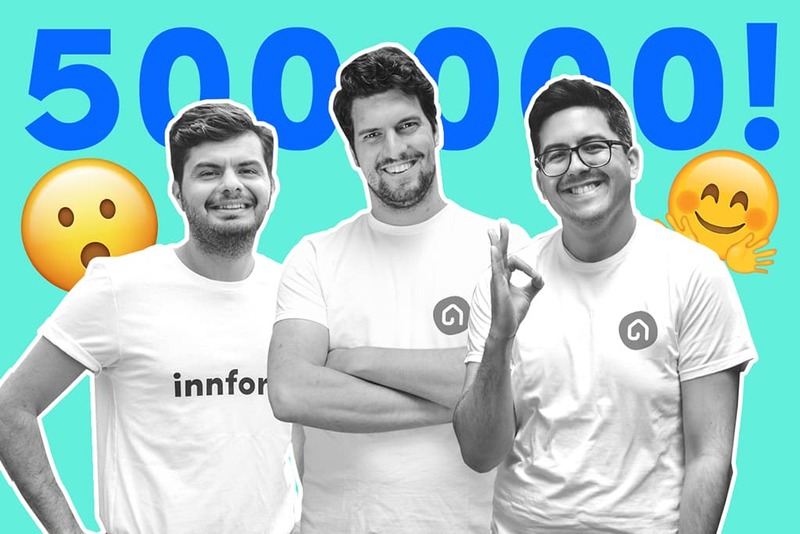 Companies have been making use of gamification for many years: the goal is always to increase, or rather establish a loop of engagement with a software product. Assuming this is done for the right reasons (such as making a learning tool more stimulating and fun to use), gamification is generally a healthy thing to have. I’ve seen many tools making use of gamification incorrectly, such as attempting to make boring content ‘addictive’. It just doesn’t work that way. The content must be great, insightful and genuinely useful to the workforce. Gamification can then be added on top of that. Good gamification techniques we know can work include leaderboards, access to exclusive areas, rewards like badges (that your employee’s colleagues can see! ), mini games and allowing learners to challenge each other’s knowledge with timed quizzes. 7. Managers deserve a good User Experience too! When we formed our first software company, Seb Azzo, we made our mission to build business tools that looked and felt like high-end consumer products. Because why shouldn’t they be? What we found over time, is that admins of a software platform often complain about the clunkiness of a tool before they become used to it. They will, not out of choice but necessity, make do with a lousy and slow interface. This leads to a kind of resentment towards the tool, which then leads to managers using the system less. Software has to inspire, like a beautifully designed car helps the driver FEEL the luxury and joy of driving something which is ultimately taking them from A to B. Utility alone doesn’t get us far, especially when it’s something we have to use daily. When our clients complain of slow adoption of a tool by their learners, we ask a simple question: Are you forcing your workforce to use it? A good training programme, despite it being part of your employee’s duties, should not be forced upon anyone. This will put a dark cloud over that tool and your staff will perceive it as something they’re being pushed to do or otherwise be punished for. Instead, approach a training programme from your employee’s point of view and focus on the tips we discussed above: Make the content stimulating using lo-fi and ‘homemade’ video, try micro learning and make brief lessons rather than long, daunting courses, and above all invest in a tool which has a great user experience. Ideally the tool works on mobile devices, so your team can use their own phones to access the material wherever, and whenever. Avoid in-app ‘surveillance’, compulsory material and even timed assessments. These are things that will put pressure on your learners, that will otherwise enjoy the platform out of pure curiosity and ambition to develop their skills. This approach also works for trainers – as we always stress, if training is not fun, you’re doing it wrong. 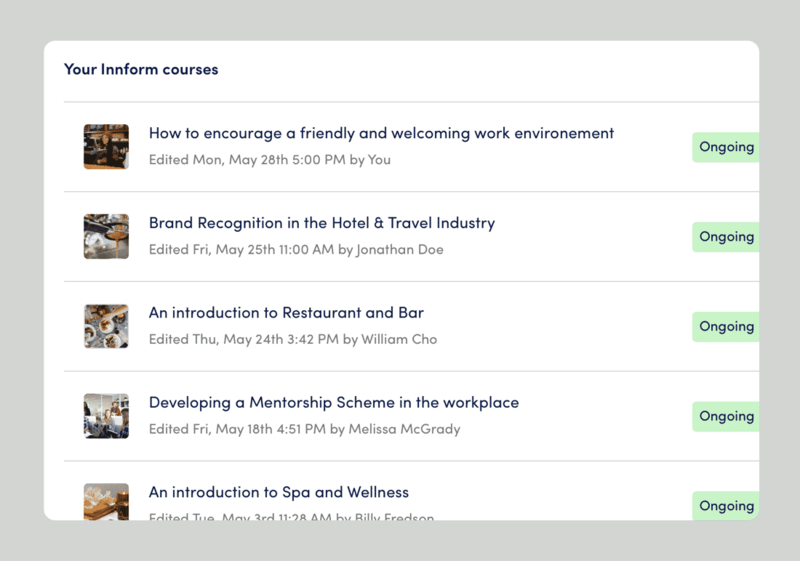 For example, Innform is hospitality training made simple for everyone – not just learners. Everyone involved should benefit from the experience in one way or another. We started our eLearning software company, Seb Azzo, on the back of one simple problem: existing eLearning SaaS tools (off the shelf subscription-based training products) are not flexible enough. Yes they are often cheaper than custom solutions (at least in the short term) and can help you implement it in your business much easier. But if the tools aren’t built for a specific industry, managers often hit a wall of usability, restricted by the features themselves. We began to give particular importance to the way assessments are carried out in our platforms – we offered ‘quizzes’ in many different ways: timed, not timed, compulsory, optional, ones that provide feedback with each wrong answer, ones that are more gamified, multiple choice, open ended quizzes and so on. This level of flexibility can inspire companies to build courses which are less predictable and more exciting for both them and their learners. Unpredictability is an essential feature in successful training programmes – we all respond well to novelty! This is the real game-changer, and informed the way we design training products going forward. Here’s the thing – no matter how advanced and gamified your eLearning platform is, it will never replace the real human rapport that employees need to have with their managers. eLearning platforms can super-charge your training efforts, make them far more cost-effective and will 10x your learning impacts globally – but they’re built on a strong foundation and appreciation for interpersonal human connection. This is why features like automatic inductions and readymade content are so great – beyond the obvious time saving benefits, they unlock valuable resources for managers to get closer to their people and rather than focus simply on micromanagement or day-to-day training, they can have deeper, more meaningful conversations about their time in the company, what they strive for and what motivates them. This is the secret to staff retention, and we’ve seen it unfold before our eyes time and time again. In conclusion, our journey is an exciting and educational one – we realised that our technology, no matter how advanced, is ultimately used by humans who deserve great learning material, a fun user experience and essential features that help everyone save time. Powerful reporting tools are a must, but nothing beats observing your team thrive and grow in their roles day after day.